With bits of caramelized walnuts (optional, if you are allergic to nuts). 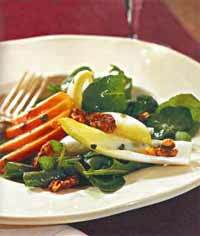 A fabulous combination of subtle sweet pears and tangy arugula. 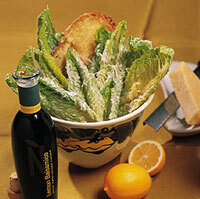 With fresh Parmesan cheese shavings and herbed croutons in a creamy dressing. Per request, with boneless chicken strips. A refreshing, exciting alternative to the ole Iceberg lettuce! Crispy Book Choy salad with colored peppers and Eastern European salad dressing delivers vitamins, while pleasing your palate and eye alike. A delicious, refreshing twist on the classic tabouleh. Pearl Barley with bits of Red peppers, fresh tomatoes, mint, cucumber or celery, tossed in lemon vinaigrette. 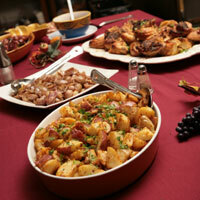 Light, excellent side dish and a sure-fire family and crowd pleaser. Topped with Ham, Ementaler, marinated peppers and a pickle slivers– a traditional Eastern European delight. No party or get-together is without it. 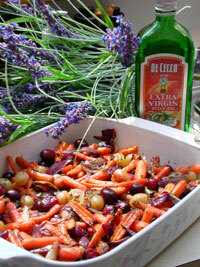 This superb side dish with French-Indian influence is a unique culinary delight of oven roasted carrots, grapes and red onions, lightly laced with Moroccan spices. 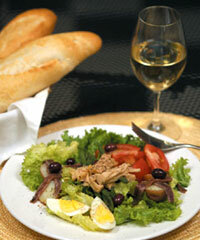 Originated in the Luberon Valley, but you’ll love it in New Jersey! An excellent complement to grilled or roasted poultry, fish or meats. Tasty roasted grapes and shallots and hearty rosemary-garlic potatoes complement the Etruscan Chicken and oven roasted Salmon entrees. 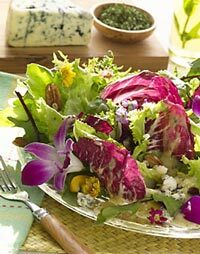 French Provençal country classic - fabulous summer salad for pool side or backyard entertaining or a great first course at a casual get together.